This is a terrible picture. 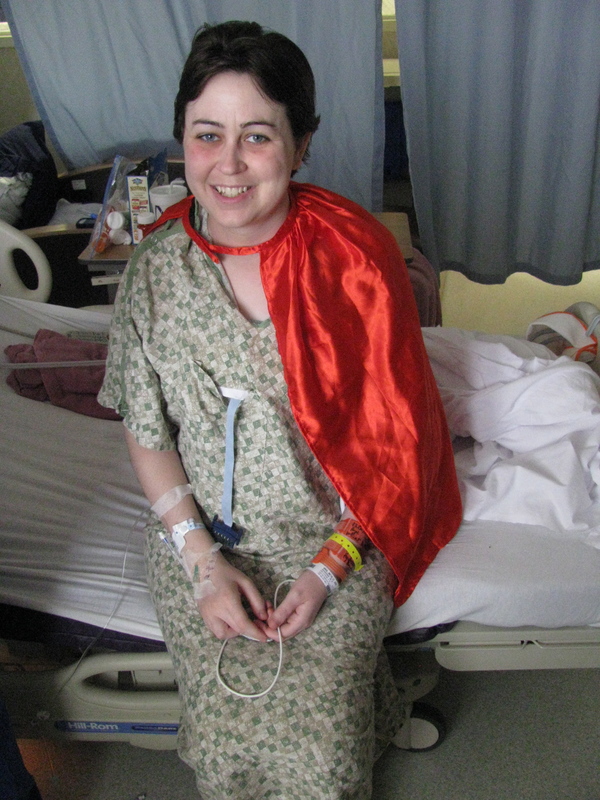 It is one day after brain surgery, the cape is for my son. You don’t see the bruises from the many tubes, or the back of my head, which has a 4-inch incision. I was lucky the surgery was perfect, and I went home the next day to recover for 6 weeks. So this was me last February. I found out I had an Arnold-Chiari malformation, and within a month had surgery to correct it. In so many ways life is 100% better now, but it is far from perfect. I still have a failed pituitary gland, due to the high pressure in my brain that the surgery corrected, and I seem to have damaged nerves all through my body that are starting to heal, and that is painful. Now I have chronic migraines. Separate issue from the brain thing, but still brain related, and it definitely slows you down. I had big goals for this week. I have a blog calendar with topics for everyday. I am searching for music students, and will possibly get to babysit the most adorable baby girl in the world for a few hours a week. I am looking for freelance writing opportunities, and studying for my Certified Personal Trainer exam. My family is broke in a weird way because of my illness and the fact that I believe in paying my doctors because they have kept me alive and running, but that’s another story for another blog. Which is another plan I have. I have another blog, based on health and fitness that is being designed and created as soon as I can communicate with the designer. So many things, and then this week, asthma and migraines take me down. I mean flat-out in bed all day, all night type of down. I am so frustrated. I know I should be thrilled that it is only a migraine and some asthma issues, considering last February was life or death, but the pain and the memory is so fleeting, and I want to really live life. I want to be busy. I don’t make resolutions. I set goals, and I make lists, and I plan big. Then I am crushed when the plans fall through. Being sick with a chronic illness is the hardest thing I will ever have to go through because of my personality. I would rather be the person nursing the sick, feeding the hungry, and doing it all with a dozen children, living on a working farm, while volunteering in schools and whatever else there is to do. I want to do a little of everything, and it is so hard when I have to stop and let my body rest. So in a time of planning, goal setting and resolutions, the quote, “We plan and God laughs.” comes to mind. I will continue to plan. I will continue to try to do a little of everything and anything that I can. I will continue to be frustrated when I can’t, but my biggest hope for this year is that people will be understanding and patient. Know that I plan, and try, but everybody has issues, and faults, and flaws, and problems, and mine is that I cannot be the person I am because I have a chronic medical condition, and there really is no shame in that. It also means I can’t drive a fancy car, own a big old house, work a full-time job or have more kids. Good things have come from my illness and the experiences I have had, I am just not counting on a cure and I am learning patience in abundance. Maybe next week you’ll get all the high-quality content, giveaways, reviews and wonderful ideas that I dream about in my darkened room. Wishing you lots of health and happiness for this New Year!